Posted on May 1, 2012 by Thomas D. Shults, Esq. Although the court order does not bode well for the plaintiffs, it does not determine with finality the plaintiffs’ challenge to congressional redistricting. Further proceedings in this case will be necessary and a final determination will likely not occur until after the November elections. 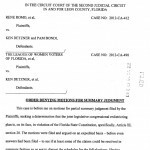 This entry was posted in Litigation Updates, News, Redistricting and tagged fair districts, florida congressional districts, florida election attorney, Florida election controversy, Florida election disputes, Florida election law, Florida election lawsuit, florida election lawyer, florida election problems, Florida election suit, redistrict, redistricting florida, redistricting florida litigation, redistricting maps, Thomas Shults, Tom Shults. Bookmark the permalink.